Many bloggers used to ask, is blogger blog or wordpress self hosted blog? If you asked 100 bloggers 80%of them reply “Wordpress”. There are many reasons behind this answer. Some of the main reasons are given below. It is the worst thing that you may come across when login to Blogger and find you blogger blog gone, deleted forever due to any error. Blogger is owned by Google, so Final word will come from them. They can drop it or make it inaccessible. Some hackers will do the same job by hacking your blogspot blog and deleting it permanently. They may delete all your google account as well to get in to a big problem. If you are using wordpress you can keep a back up of your blog in any other server. Back up is very important for any website. Here are a few simple ways to keep your Blogger blog safe and backed up. In this tutorial I will explain how to keep automatic back up of your blogger blog. So you can get back your blogger blog if it gets accidentally deleted. But there is a small problem with this hack. That I will I explain at the end of this post. All this screen shots are of new blogger interface. So try new blogger interface before proceeding towards the next step. Enter your other email id and click ok.
After completing above step you can check for an email in your other Gmail account about invitation to become author of the earlier blog. You should confirm link given in that email and login with the Gmail account to confirm it. Now you are an author of the earlier blog. Now you can come back to the older blogger account. Again navigate to setting section. There you can find two email accounts embedded with your blog. 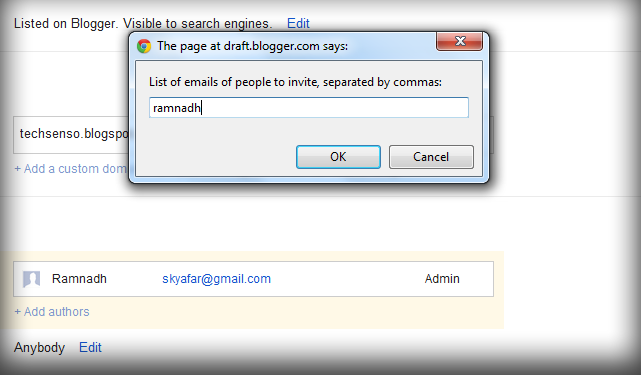 You can make other mail as admin of your blog. That is enough for to keep a back up of your blog. How to reproduce your deleted blogger blog. To check it, drop your blogger blog from the older blogger account. After deleting your blogger sign in to other blogger account. You can’t find it there? 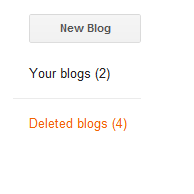 Then check deleted blogs there you can find your blog and undeleted it. Remove authorship of older Gmail account. To make it more secure. If you want to check it “Don’t play with your Favorite blog”. Make a new blog and check how it is working. If you know any other methods for automatic backing up for blogger blog try to mention it in comments. And if you feel confusing with this method you can contact me or give us a comment. Thanks for the enlightenment. I should do this right away. Great piece of info here.